The Towns of Leyden, Rowe, and Wendell are currently developing Multi-Hazard Mitigation Plans with assistance from the FRCOG Planning Department through a grant from the Massachusetts Emergency Management Agency (MEMA) and the Federal Emergency Management Agency (FEMA). The purpose of a Multi-Hazard Mitigation Plan is to identify natural and other hazards that may impact the community, such as floods, winter storms, and spills of hazardous substances; conduct a risk assessment to identify infrastructure at the highest risk for being damaged by hazards; inventory and assess current Town hazard mitigation policies, programs, and regulations; and identify action steps to prevent damage to property and loss of life. Towns with plans approved by FEMA and MEMA are eligible for state and federal grant monies to fund pre- and post-disaster mitigation projects to reduce the impact of future natural and man-made disasters. The FRCOG has assisted all 26 Franklin County towns with developing a plan. For information on available hazard mitigation grants see http://www.mass.gov/eopss/agencies/mema/hazard-mitigation/grants/ or contact Kimberly Noake MacPhee at kmacphee@frcog.org . 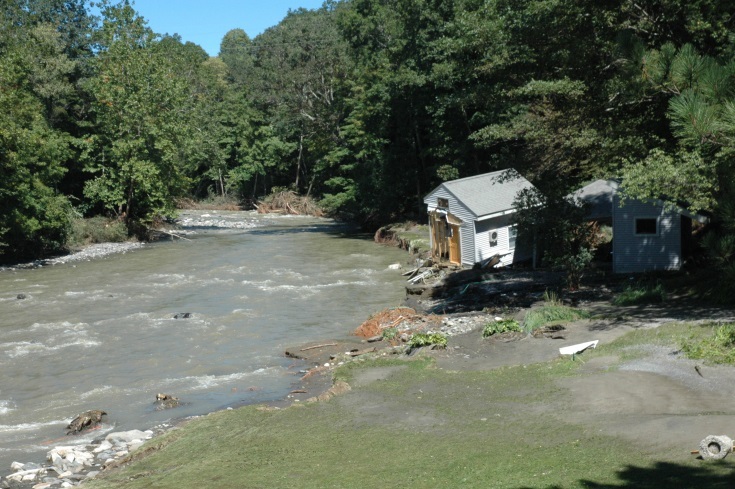 Property damage, such as this which occurred as a result of Tropical Storm Irene, is one of many topic explored during hazard mitigation planning.